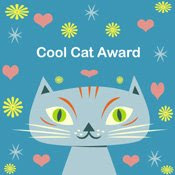 Cool Cat Award!! This is my latest award and it’s really unique. It was given to me by Ate Liza (a rich blogger) and a proud member of Pinay Mommies Community. I like to share this award with my really COOL friends namely Nelle, JK, Nancy, Jessie, Janet, and Lalaine. thanks for this award. will claim it soon.